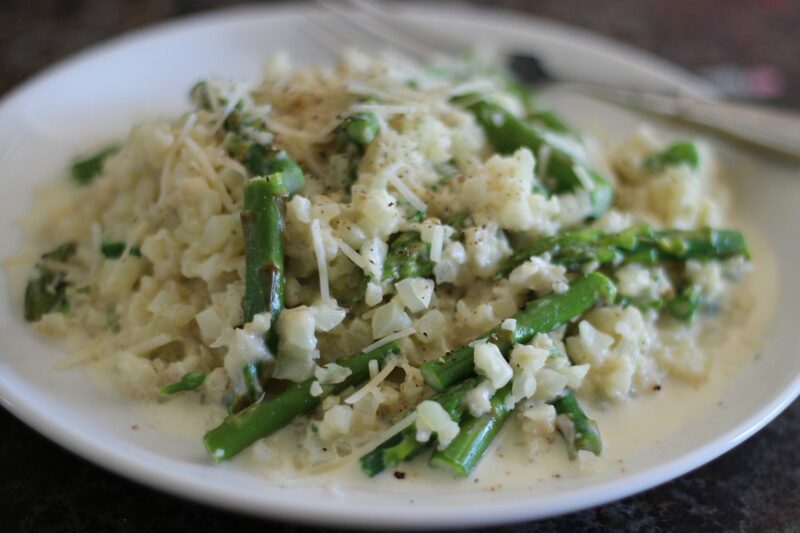 This creamy asparagus cauliflower rice is a deliciously low carb way to get those veggies in. It’s creamy and garlicky and you won’t miss the starchy rice at all. Asparagus is one of my favorite vegetables. No scratch that. It is my favorite vegetable. I love it on salads, in quiche and I just adore spicy pickled asparagus spears. Rice, on the other hand, I could take it or leave it. Sure I miss sushi or a good chicken fried rice, but I don’t think about them often. There is this one dish though. In the freezer section at Trader Joe’s they have this asparagus risotto. It’s delicious. 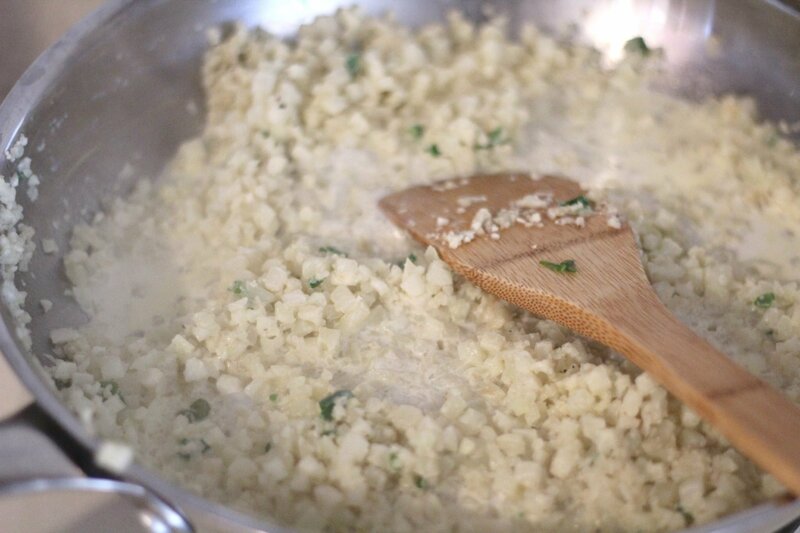 You just cook the contents of the bag on the stove top and you end up with this garlicky creamy rice dish. Of course it’s completely high in carbohydrates and probably other things we don’t want to think about. 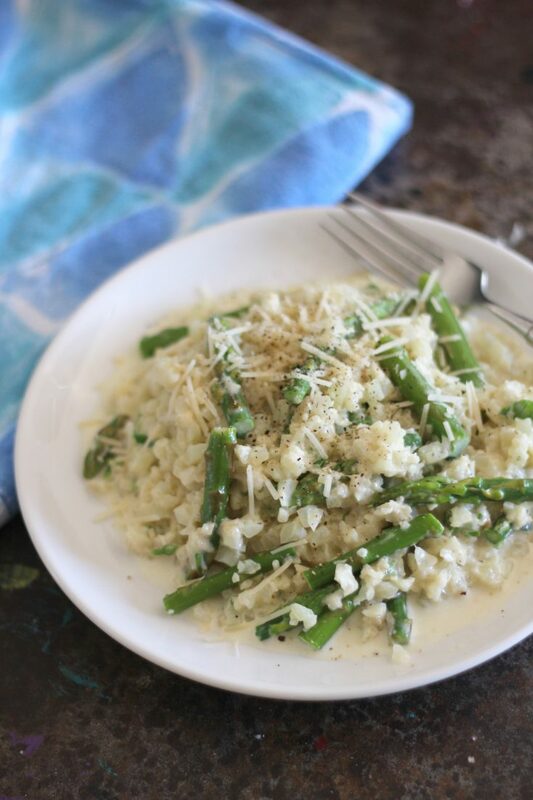 So I set out to make my own low carb version with this creamy asparagus cauliflower rice. Cauliflower rice is fun because there are really so many possibilities. You can buy the cauliflower pre-riced, which I’ve seen both at Costco and Trader Joe’s. But I have to warn you that it needs to be used within a day of purchasing, since the stuff does not last. I have wasted enough packages of pre-riced cauliflower, that I won’t do it again. Plus, it is so easy to rice yourself. If you have a food processor, that’s the easy way to do it. Except for the cleaning of the parts, it is quick and simple. Or you can just use a box grater, and grate the raw cauliflower like you would cheese, stem and all. The first step to making this asparagus cauliflower rice is to cut and blanch the asparagus. Trim off the tough ends of the asparagus and chop into smaller pieces. Boil some water with salt. Once the water is hot and boiling add the asparagus. After two minutes remove the asparagus and rinse it with cold water. Then set the asparagus aside. 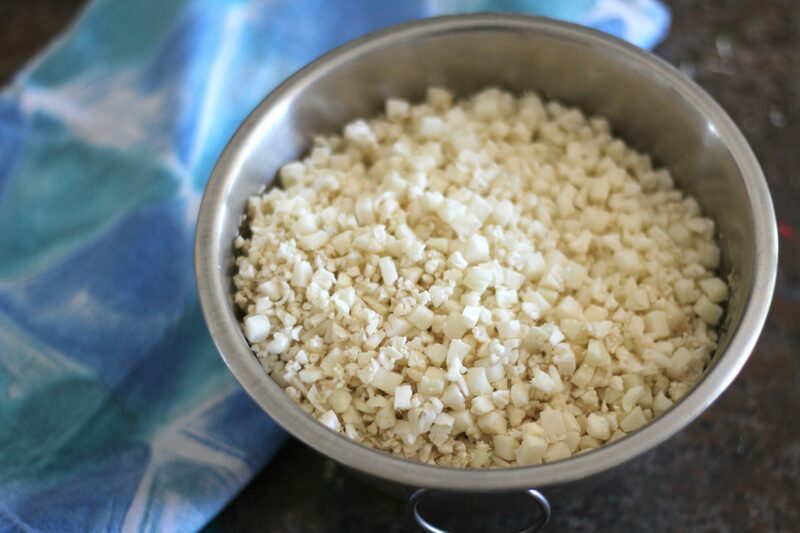 While the water is coming to a boil, start grating the cauliflower if it isn’t already riced. In a large pan, heat up the olive oil and the minced garlic. Add cauliflower, chicken broth, green onion and, some of the heavy cream. Stir and keep on medium heat while the liquids start to evaporate. Next, add more heavy cream and the grated parmesan cheese. Stir in asparagus and simmer. Finally, top with parmesan and freshly ground black pepper. Boil water with a pinch of Kosher salt. Trim off the tough ends of the asparagus and chop into smaller pieces. Add asparagus to boiling water. After two minutes remove the asparagus and rinse it with cold water. Then set the asparagus aside. In a large pan, heat up the olive oil and the minced garlic on medium heat until garlic appears clear. Add cauliflower, chicken broth, green onion and, half of the heavy cream. Stir and keep on medium heat while the liquids start to evaporate. Add more heavy cream and the grated parmesan cheese and simmer. Stir in asparagus. Top with parmesan and freshly ground black pepper. 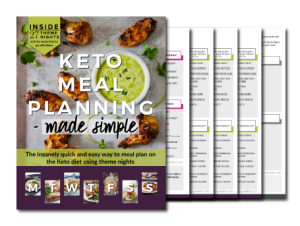 I am not doing Keto, but this sounds sooo yummy! I am definitely always looking for simple, appetizing veggie recipes to trick my tribe into eating better. I’m going shopping tomorrow, hope the asparagus is reasonable! Or maybe I will try it with some other veggie. 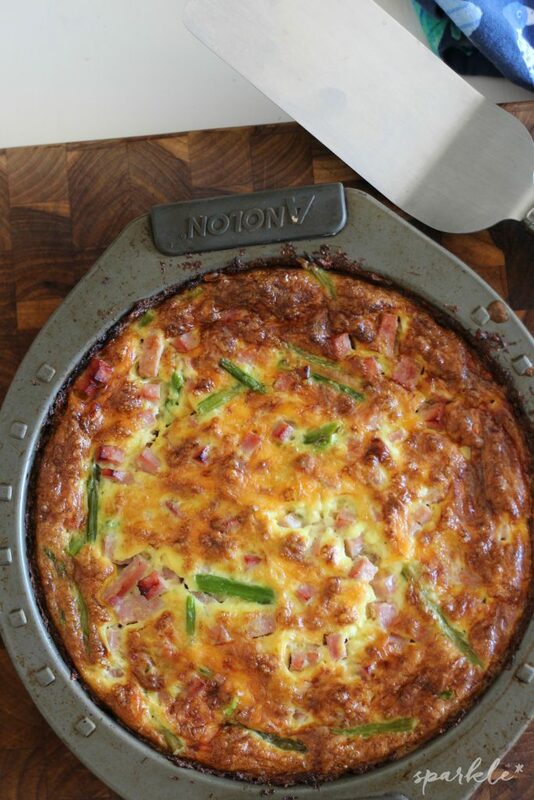 Thanks so much for sharing your awesome post with us at Full Plate Thursday! Hope you are having a great week and come back to see us real soon. Never tried cauliflower before, but these look good! Thanks for joining FF. I love Cauliflower and Asparagus so this sounds wonderful. Thank you for sharing at Happiness is Homemade.